Mary has a passion for teaching mathematics based on the firm belief that all students can be motivated and supported to achieve and need not be left behind due to special needs, interruptions to study, family circumstances, or even a past history of low success. She makes it her mission to explain the uses of mathematics in a wide variety of fields, and is well known for presenting interesting lectures and courses that challenge students to think. 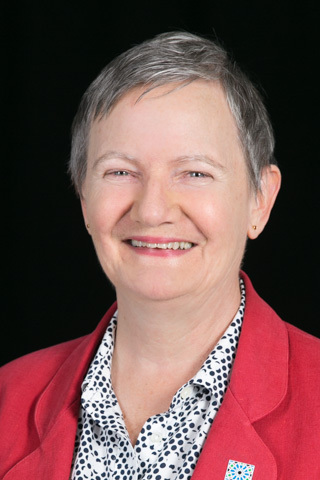 She currently teaches first year mathematics, mainly to Engineering and Science students, and also is the Director of the UTS Mathematics Study Support Centre. Conference Chair, Engineering Mathematics and Applications Conference (EMAC) 2011 Annual Conference. Organising committee, Mathematics Education Research Group of Australasia(MERGA) 2014 Annual Conference. President, Australian Association of Mathematics Teachers (AAMT) 2014-2016. In the 2014 academic year Mastery Learning was implemented in four first-year mathematics subjects in an effort to address a lack of preparedness and poor outcomes of increasing numbers of undergraduate students in science, engineering and mathematics programs. This followed partial success in the use of diagnostic testing and pre-teaching, active learning, and a greater emphasis on problem solving in context - under-prepared students were still more likely to fail the pre-teaching subject and to struggle with subsequent mathematics subjects. Also, failure rates overall were higher than benchmarks required. This paper describes the learning design used, and the outcomes achieved, with implementing Mastery Learning – the positive: improved academic success, time management, and attitudes towards learning and Mathematics, an increased sense of independence, confidence and retention of content, and reduced stress and anxiety; and the negative: students having a sense of being taught how to pass a test rather than having a deeper understanding of the content. It will be seen that this negative is a consequence of a small but important difference in implementation. UTS Science, Engineering and Mathematics students who have studied General Mathematics at high school are far more likely to fail their first undergraduate mathematics subject compared to their counterparts who meet the non-compulsory 'Assumed Knowledge' of 2 unit Mathematics. This problem has been growing in recent years as an increasing number of students seek to improve their tertiary entrance score by taking the no-calculus General Mathematics at the Higher School Certificate. This problem is not unique to the University of Technology, Sydney - mathematical under-preparedness is a problem world-wide, with a decade, or more, long history. For some years, UTS has used diagnostic testing and pre-teaching to assist under-prepared students. Unfortunately, students who studied General Mathematics are also more likely to fail the pre-teaching subject. This suggested something more was required. Mastery Learning was chosen as a potential solution. Results to date have been promising with improvements in academic success for under-prepared students. Students have also reported increased satisfaction, confidence and retention of content. However, some students felt all Mastery Learning taught them was how to pass the Mastery Tests. Differences in student experience appear to be due to differences in how Mastery Learning was implemented. A process is described for creating a more civerse set of experiences for undergraduate students in mathematics. While we use examples drawn from classes studying linear algebra, the procedures are appropriate for any undergraduate course in mathematics. The diversity of the activities is generated in part through the use of a taxonomy which addresses the nature of the activities rather than a hierarchy of levels of difficulty. All exercises used as illustrations have been attempted by students in second year undergraduate classes. © 1998 Taylor & Francis Group, LLC. In this paper, we describe aspects of a programme to enhance student learning in undergraduate mathematics. We present ways of constructing formal examinations which assess a range of knowledge and skills and which encourage students to reflect on their learning. To assist with this process, we propose a taxonomy to classify assessment tasks ordered by the nature of the activity required to complete each task successfully, rather than in terms of difficulty. An extensive list of university level examples is given to illustrate descriptors in the taxonomy and to provide ideas for those interested in implementing an alternative approach to writing examination questions. © 1996 Taylor & Francis Group, LLC. COUPLAND, M 1995, 'UNDERSTANDING IN MATHEMATICS - SIERPINSKA,A', EDUCATIONAL REVIEW, vol. 47, no. 2, pp. 232-232. This review aims to critically promote quality research and focus on the building of research capacity in Australasia. whether the nature of the ML tests encourages a focus on shallow learning of procedures, and whether the structure of the assessment regime provides sufficient motivation for learning more complex problem solving. We analysed assessment data, as well as student reports and survey responses in an attempt to answer these questions. Coupland, M.P., Stanley, J., Groen, L., Bush, S.A. & Beames, S.Y. 2013, 'Are Science Students Ready for University Mathematics? ', Australian Conference on Science and Mathematics Education, Uniserve Science, The University of Sydney, NSW 2006, Australia, Canberra, pp. 93-96. Coupland, M.P. 2000, 'First Experiences with a Computer Algebra System', Mathematics Education Beyond 2000. Proceedings of the Twenty-third Annual Conference of the Mathematics Education Research Group of Australasia Inc. held at Fremantle, Western Australia, 5-9 July 2000., M.E.R.G.A., Fremantle, W.A., pp. 204-211. Groen, L, Coupland, M, Memar, J & Langtry, TN 2014, 'The past, present and future student of Mathematics – mastery learning to address the assumed mathematics knowledge gap, encourage learning and reflection, and future-proof academic performance', The Australia New Zealand Mathematics Convention, Melbourne, Australia. First year students and academic staff in Science, Technology, Engineering and Mathematics (STEM) disciplines currently face many challenges. Failure rates at UTS are high in first year undergraduate Mathematics subjects for STEM programs. These high failure rates are particularly pronounced in students who studied General Mathematics this includes the subject Foundation Mathematics, a subject designed to address any gap in assumed knowledge and skills of first year students. Attrition is also a concern, with around 10% attrition after one semester and an additional 15% after two semesters. UTS is not alone in facing these challenges – under-preparedness for tertiary mathematics is a problem world-wide. When this problem first came to light more than a decade ago, UTS introduced the Readiness Survey (diagnostic test) to assess the extent to which the 'Assumed Knowledge' could indeed be assumed. This assessment of assumed knowledge and the associated pre-teaching could be effective but as the failure rates demonstrate, success has been mixed. A meeting of first year Mathematics academics in 2013 decided to trial a different and historically successful approach – Mastery Learning. Mastery Learning endorses the belief that aptitude relates to the amount of time it takes someone to learn, rather than necessarily capability to master content. The research literature indicates positive effects of Mastery Learning on students, especially in achievement, attitudes towards learning and retention of content. This paper describes the learning design and positives and negatives of implementing Mastery Learning in first year Mathematics subjects. Maths Inside: Highlighting the role of mathematics in society as motivation to engage more in mathematical activities.